By Kori ~ September 13th, 2010. We spent Labor Day Weekend visiting the Walla Walla Valley AVA. 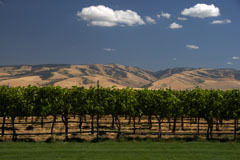 The Walla Walla Valley AVA was established in 1984 as Washington Stateâ€™s third AVA. It encompasses areas in both Washington and Oregon. When you are visiting wineries and vineyards in the valley, it is easy to forget which state you are in. The lines become even more blurred when it comes to the wines themselves. You may have a Washington winery producing wine from Oregon grapes, an Oregon winery using Washington grapes, or a winery in either state blending fruit from both states. Thank goodness for the AVA system as it is easier to just say that a wine is from or a winery is in the Walla Walla Valley rather than concerning oneself with the state lines. We arrived in Walla Walla, on Thursday afternoon, checked into our hotel, and then crossed the state line into Oregon for happy hour at Tero Estates. We sat outside in Windrow Vineyard and enjoyed the wines of Tero Estates and Flying Trout and visiting with Doug and Jan Roskelley and Ashley Trout. On Friday morning, we headed back into Oregon for a visit to Seven Hills Vineyard. Managing partner Norm McKibben gave us a tour of the vineyard as well as the entire SeVein Vineyards project. We rounded out the day with visits to Plumb Cellars, Rotie Cellars, and Locati Cellars. Saturday brought visits to Reynvaan Family Vineyards, Rasa Vineyards, and Adamant Cellars before rushing back to the hotel to watch my Washington Huskies play BYU in their opening game of football season. However, given their disappointing performance, it would have been more enjoyable to visit a few more wineries instead. After the ballgame, Dad (John) and I walked down to Vintage Cellars, a wine bar located in downtown Walla Walla, and tried a few more local wines by the glass. Vintage Cellars is a must-visit when you are in Walla Walla. Nicole Rivinius, the wine buyer for Vintage Cellars and also the Sales & Marketing Director for Rotie Cellars, was a great host. She stocks an excellent selection of Washington wines. So if you donâ€™t have time to visit all of the individual wineries and tasting rooms in Walla Walla, Vintage Cellars is a great place to try and even buy some additional local wines. They also offer live music on most Monday and Saturday nights. We only visited two wineries on Sunday, Trio Vintners and Tertulia Cellars, in order to enjoy a day of rest and watch more football on television. On Monday, we crossed the Oregon state line once again and visited Watermill Winery in Milton-Freewater. 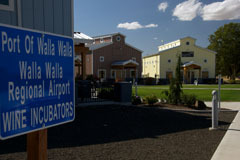 Then we headed for the Walla Walla airport area and visited the rest of the â€œincubator wineriesâ€ including Lodmell Cellars, CAVU Cellars, and Kontos Cellars. On this trip, we toured one vineyard, visited 14 wineries, and tasted 63 wines. A quick look at the list of wines below will show that the standout wineries for us were Rasa Vineyards, Rotie Cellars, and Watermill Winery. In fact, we discovered another â€œWow!â€ wine, the 2007 Rasa Vineyards Principia Reserve Syrah. It was a pleasure to meet so many wonderful people along the way. In the coming weeks, I will be writing in more detail about some of the wines and wineries that we encountered. Hereâ€™s a breakdown of the wines that we tasted while visiting the Walla Walla Valley. 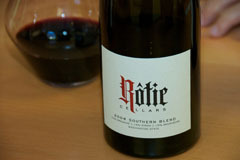 Under each Quality heading, the wine name and region will be listed along with price and QPR rating. Wines in bold type received a QPR rating of 5 bangs for your buck (out of 5).